How to use the Noticeboard to send a message to the members of your Board. On your board's noticeboard page you can post a message by clicking in the box at the top of the screen. This opens the message composer, where you can type your message and style it using the formatting icons in the toolbar. To add links to the message, click on the link icon in the toolbar (shown above) to bring up the link editor panel. Enter the text you want the link to be displayed as in the Text to display box (e.g. 'Click here to...'). You can then either paste an external link in the Link to box, or click on the folder icon to browse through your board's documents section and choose a file or folder to link. You can also add emojis to your message by clicking on the emoji icon (shown above) to bring up the emoji picker. 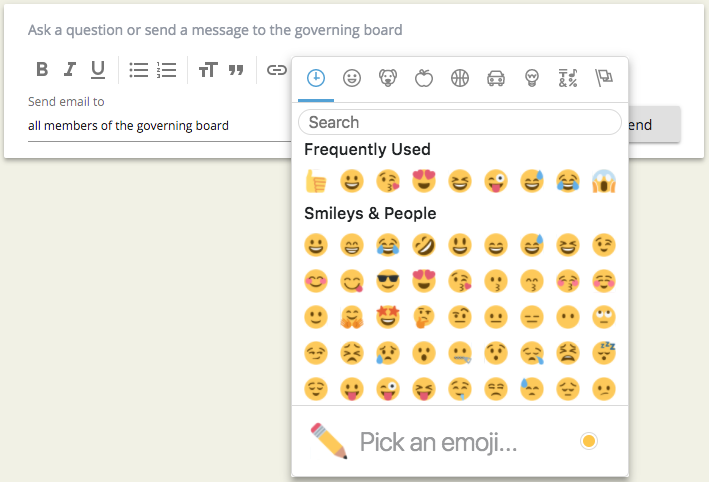 Emojis work great with reactions - find out more here. When creating a noticeboard post, you can notify everyone by email or choose to only notify members of a particular committee by selecting from the Send email to dropdown. The message will be visible on the noticeboard to all board members, but only the committee members will receive an email about the post. When you are happy with your message, click Send. This will post your message on the noticeboard and send an email to the chosen members of the board to notify them of the post. The email from GovernorHub will say '[Your name] has posted in [School Name]' and will contain the full text you have entered on the noticeboard. To comment on a noticeboard post, click on Add a comment and type your message. To add a link, simply copy the link URL and paste it into the body of the comment. When you click Send, the link will automatically be detected and turned into a link.